Indore, India (AP) — Hardik Pandya was promoted to No. 4 and smashed 78 off 72 balls as India beat Australia by five wickets in the third one-day international on Sunday to clinch the series. India finished on 294-5 in 47.5 overs in reply to Australia’s 293-6 and took an unassailable 3-0 lead in the five-match series. Pandya won his second man-of-the-match award in three games. This was India’s sixth successive win in a bilateral ODI series against all teams and puts them top in the one-day rankings. It was Australia’s 11th loss in 13 ODIs away from home. Allrounder Pandya struck five fours and four sixes after he was surprisingly promoted up the order. He built on the groundwork laid by openers Ajinkya Rahane (70) and Rohit Sharma (71). Earlier, Aaron Finch scored his eighth ODI hundred for Australia. Finch scored 124 runs off 125 balls, with 12 fours and five sixes, and shared 154 runs for the second wicket with Australian captain Steve Smith (63 off 71) to shore up the misfiring Australian batting. Smith had won the toss and elected to bat first at Holkar Cricket Stadium. Pandya bowled with great control on a batting-friendly wicket, returning figures of 1-58 in 10 overs. Unchanged India began their chase with a 139-run opening stand. Sharma reached his 33rd ODI half-century off 42 balls, while Rahane got his second successive half-century – and 21st overall in ODIs – off 50 deliveries. India’s 100 came up off only 90 balls as the duo continued to attack Australia. Sharma was the first to fall, miscuing a shot to deep midwicket off Nathan Coulter-Nile in the 22nd over. Sharma faced 62 balls overall, and hit six fours and four sixes. When Rahane was trapped leg before by Pat Cummins (2-54), Pandya and skipper Virat Kohli (28) were brought together at the crease, and they kept the attacking momentum going. The duo added 56 runs for the third wicket. 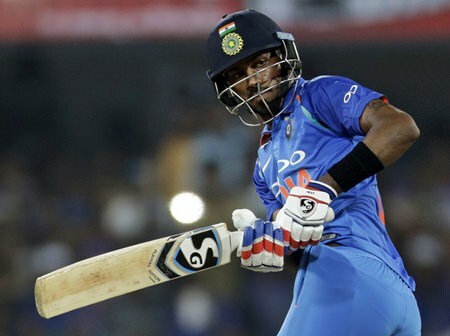 Pandya took a liking to Ashton Agar and carted him for four sixes, bringing up his 50 partnership with Kohli off 55 balls. India crossed 200 in the 34th over and the result seemed a formality. Australia struck back with a double-blow. Kohli holed out to long-on off Agar in the 35th over, while in the next over, Kedar Jadhav (2) was caught behind off Kane Richardson. India were reduced to 206-4. Manish Pandey (36 not out) then joined Pandya and put on 78 runs for the fifth wicket. Pandya fell with 10 runs needed, holing out to mid-on off Cummins. MS Dhoni (3 not out) completed the formalities. This was Kohli’s 30th win in 38 ODIs as captain, second only to Ricky Ponting (31). The fourth ODI is at Bengaluru on Sept. 28.